The Self & Match Digital T-Chart is a great accompaniment to the Self & Match manual. After purchase, please select the option to ‘Return to Merchant’ to receive your digital download. All students thrive on clear expectations. Because of this, we urge educators, clinicians, and parents to systematically and explicitly teach expectations across various settings. 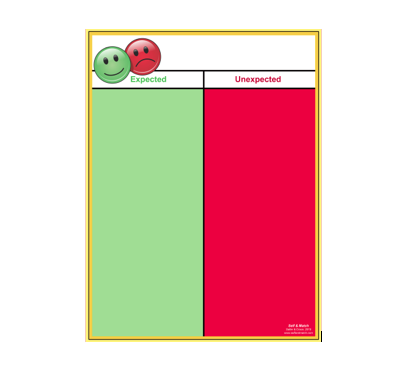 In order to accomplish this, we’ve seen T-charts made in a variety of formats — For instance, you can easily create a T-Chart by writing expected and unexpected behaviors on a poster board to hang in your room. Over the years, we’ve often been asked for a template for these T-Charts. If you purchase this digital template, you can simply print out the T-Charts (1 for each class rule) and hang them in your classroom. This is a great activity to complete as a whole class. NOTES: We recommend printing this digital T-Chart in size 18×24. To extend the use of the T-Chart, you may wish to laminate it. T-Chart digital file download product is NON-Refundable.